Spain's greatest golfer. An icon. An inspiration. These are just some of the tributes flooding in for Severiano, or Seve, Ballesteros, following the news of his death. The announcement came on Spanish television, TVE, early on Saturday. The Ballesteros family soon confirmed in a statement that the golfer had died at 0210 (0010 GMT), surrounded by relatives, at home in Pedrena, northern Spain. He had been fighting brain cancer for two-and-half years, in what he himself called "the biggest battle of my life, my 6th major". On Friday, his family announced that his health had suffered a severe turn for the worse. The news cast a dark cloud over the Spanish Open golf championship, under way in Barcelona. Tournament flags were lowered, and players emerged wearing black ribbons in honour of the man they call the father of Spanish golf, their role model. At 1445 on Saturday, all play froze for a moment of silence in his memory. Footballers at Seve Ballesteros' local club, Racing Santander, also wore black armbands for their match - a tribute to a great sportsman, and a unique man, who fought against his illness to the last, according to club president, and Seve's friend, Francisco Pernia. Seve's former golf partner Jose Maria Olazabal was in tears during practice ahead of day three of the Spanish Open. But he said he would play on, as the best possible homage to his role model. "I have always been grateful to him, for giving me the chance to play at his side," Mr Olazabal recalled, and added that what he would remember is Seve's personality and strength, his passion for everything he did. Many other sports personalities have expressed their own sorrow at Seve's death. Formula One driver Fernando Alonso called him a pioneer of golf in Spain: A man who discovered the sport for his country, and someone who would always remain as one of the greatest in Spanish sport. Barcelona manager Pep Guardiola said Seve Ballesteros was admired and loved in all the world. Footballer Raul commented that Spanish sport has lost one of its greats. Alongside them, and Spain's Royal Family, the country's politicians have also rushed to remember Seve Ballesteros. Prime Minister Jose Luis Rodriguez Zapatero said his career marked a turning point in sporting history here. 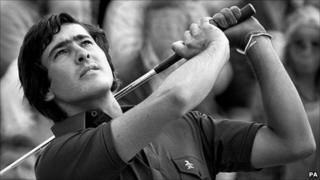 Seve Ballesteros stormed the international sporting stage in 1976, when he finished second in the British Open. He went on to win three years later. Image caption Seve Ballesteros called his fight against cancer "my 6th major"
His huge success then made him an ambassador for a country just emerging from four decades of dictatorship and international isolation under General Franco. "He was a symbol of the new, democratic Spain," Mr Zapatero said. "Open to the world, without complexes, and capable of being up there with the best in any discipline, including those we had hardly any tradition of, like golf". His success helped Spain hold its head up high again. "He was then, what someone like Rafa Nadal is today. But he came at a time, when we really needed those victories, on the international sports stage," agreed Spain's secretary of state for sport, Albert Soler. As well as putting Spain on the golfing, and sporting, map, many commentators point out the huge boost Seve gave the game at home. With his flair and famous charisma, he helped make golf something for the masses, not just the elite. He made it popular. And, in remembering the golfer's life, many have also paid tribute to the great strength he showed in his illness. The regional president of Cantabria, where Seve was born and where he died, recalled a recent trip to Madrid with the golfer. "I offered my arm to help him, and he told me: "I'm stronger than you"," Miguel Angel Revilla said. "He used to walk four or five kilometres a day and lift weights. He thought this was a battle he could win, but about 12 days ago, it seemed he was losing." Severiano Ballesteros was 54. His funeral will be held on Wednesday, according to Spain's EFE news agency, and the golfer's ashes will then be returned to his home in Pedrena, as he himself wanted.